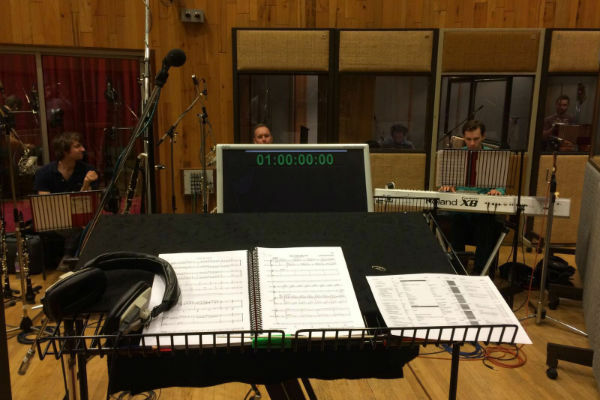 After working daily on the show in preparation for the West End premiere concert presentation, Robert J Sherman’s production assistant Thomas Josling dropped in again when the company re-united to record the cast album. The big day might be over, but after the success of our charity gala performance at the Adelphi Theatre on 4 September 2016, the cast re-assembled at Angel Recording Studios to create the original cast recording of BUMBLESCRATCH. Under the watchful eye of the Angel Studios team, musical director Tom Kelly led two days’ worth of sessions in Studio 1. The opportunity to preserve the music of BUMBLESCRATCH in this vicinity with both cast and orchestra makes this a special experience; and with a cast of thirteen and an orchestra of ten, we bring quite a punch. The process for a recording of this nature is to tackle each number one by one, recording the band live with the cast in several takes to ensure we can pick out the perfect take in mixing and editing. With this in mind, as is the case in the world of theatre, time is never our friend. To lay down a sung-through musical in two days requires efficiency and a stellar team – luckily, we have the best of the best. Sometimes this process can be monotonous; most of the time, it’s a wonderful game of listening for perfection. From the nicely-furnished, air-conditioned spot in the control room, there are certainly worse jobs. As we reached the end of the second day of sessions, there was a deserved feeling of pride around the BUMBLESCRATCH team. We think we’ve created something beautiful, and we can’t wait for you to hear it. You can pre-order your copy of the BUMBLESCRATCH original cast recording now by visiting www.simgproductions.com.